Milk Breath and Margaritas: O Romeo, Romeo! wherefore art thou Romeo? My great-grandfather's name was Romeo. He arrived as a teenager at Ellis Island, an immigrant from Italy. He was a strong man and even in his 80s and 90s his large hands gripped in a firm steady handshake. His English was heavily accented and I remember how he would speak to me; quietly, leaning toward me a bit, smiling, and then pausing, perhaps to see if I had understood him. I usually did. He became an American and a farmer. He loved to grow roses. They grew where he planted them and thrived - big, colorful, and sweet smelling. He had a lovely farm. I remember walking with him to the spring house, a small stone building built into the side of a hill behind the farmhouse. Water running under those rolling green hills in Pennsylvania came out through a pipe in the wall and dropped sparkling into a long wooden trough. The spring house was cool even on the hottest summer day, and Grandpap would hand me the dipper and a cup. The water tasted clean and cold and pure. The spring house smelled of water and apples. Buckets of apples picked from the trees were placed all around and I'd select one, biting into it's juicy sweet-tartness, and follow him back out of the spring house and into the sun. I remember exactly the way my great-grandfather smelled. He smelled like Italy and like his farm and like Gam's cooking. I am aging. It's the only explanation for waking up on a Saturday morning and apropos of absolutely nothing, thinking about Grandpap, my Romeo, and realizing all of a sudden that I remember exactly what he smelled like and I'll never smell it again for no one will ever smell like it again. I've never even been to Italy but I know he smelled of it; I breathed the Old World when I was with him; it's the only explanation for the parts I can't identify. When I was married he was nearly 100 years old and scheduled his blood tranfusion for that day so he'd have the energy for the wedding festivities. At the reception he danced with me, singing an Italian love song in my ear, and you'd think that would have been all the luck that marriage needed but it wasn't. As it turned out, that moment with Romeo, my great-grandfather, had nothing to do with my ill-fated union. That love song was about him, my Romeo, and the bits of him that would live with me. It had more to do with the fact that each time I was pregnant I wondered if it was a boy, could I name him Romeo? It's a beautiful name, a family name, and a super cool name, but would the boy be teased until he was 25 years old, or maybe forever? Could I tell him enough about his Romeo that he'd set his shoulders and bear it and find his way to pride in the name? I look at my little blonde haired, fair-skinned, light-eyed sons and they don't look like they have a drop of Italian blood in them. But they do - only a few but those few are broad and powerful and full, like a drop of clear spring water that has welled up until it is about to explode from it's invisible, permeable boundary. My Romeo, my Grandpap, died at 99 years old, just 3 months before my daughter was born so he never saw her here. That was and remains a great sadness to me. What a blessing to wake one morning at age 42 filled with fond memories of an old Italian great-grandfather smiling and smelling of your history. I think of him whenever the roses smell sweet. what a beautiful post. what sweet memories!! 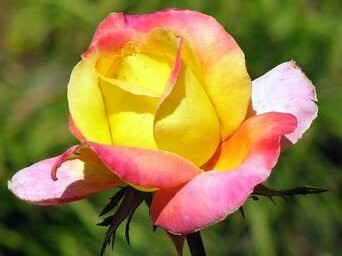 A beautiful rose and tender reminiscence of your grandfather. You are lucky to have such wonderful memories. Absolutely beautiful. Makes me think of my own "Romeo" and his yellow roses. I'm welling up here. But it is beautiful & sparkling like the water in the spring house. Tears! Such a wonderfully beautiful post. Thanks for sharing it with us. He saw her... he sees her.. and you.. and your boys. He gave up his physical presence in this space so he could watch your blossoming family with fresh eyes and wrap you all in love. Beautiful post. What a beautiful story...consider yourself lucky! What beautiful memories and how lucky for you to have known him. And how lucky for us that you are sharing your history. This is just beautiful. Amy, just thank you. Lovely reminiscence... I personally believe your grandfather can see your daughter and love her, albeit from a time/space distance that's harder for you than for him. I can still smell the apples in my grandfather's green truck and see he light through the trees on those western Massachusetts country roads... So I'm with you on this one. I'm guessing that would be a double delight hybrid tea rose. wow, thank you. that was beautiful. And I love that he was named Romeo . . . I read it with a tear in my eye missing my grandparents. Lovely post. You're actually quite lucky. Both my Grand Dads died during the war and my one Grand Mother died a few years after that. My Father died three months before I was born. My Nan died a few years ago and I still think of her most days. She cooked great Sunday dinners and every time I see one I always think of her gravy!!!! Amy, this post was absolutely beautiful. What a lovely tribute to your grandfather, and a very special capture of your memories. I loved how you incorporated the Romeo & Juliet quotes. Very creative, you are, my friend! rubbish - I am extremely lucky! I grew up with all of my grandparents and a couple of great-grandparents, like my Romeo, who was my mother's grandfather. It was a blessing.